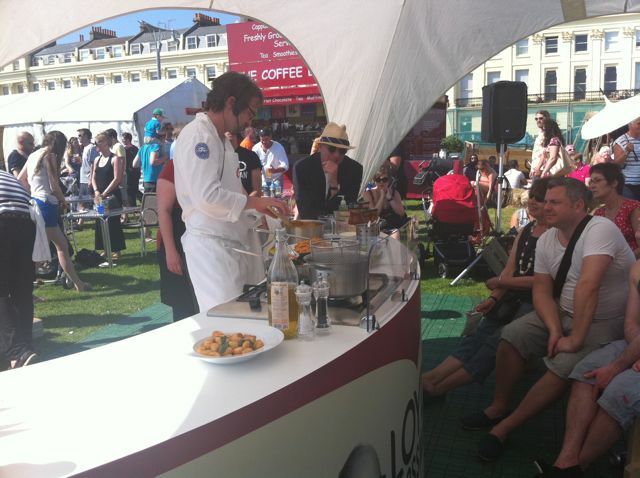 One sunny afternoon in May, myself and Ben had the pleasure of attending the 2012 Foodies Festival, on Hove Lawns in Brighton. It was an unseasonably warm day, and strolling around tasting food and drinking wine was pretty much my ideal scenario. 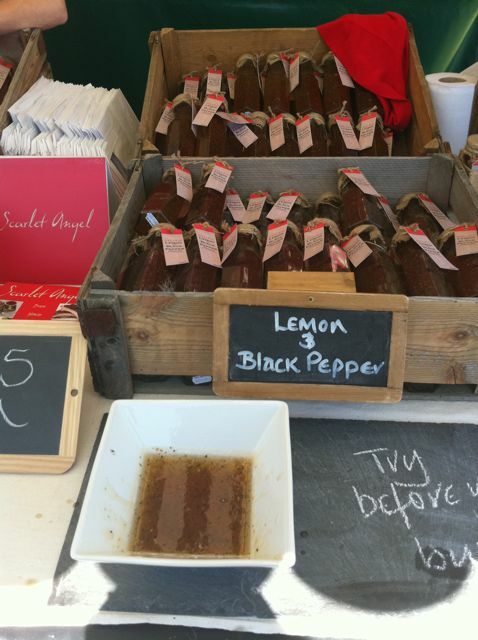 We visited the London Foodies Festival last year and had a really lovely day so we were hoping for a repeat experience! We arrived about 1pm and started exploring all the different stalls and stands. On first glance it seemed to be smaller than the Hampton Court one, but we soon realised it stretched down the Lawns a lot further than we thought and there really was plenty to see. We immediately saw a stand we wouldn’t be able to bypass. 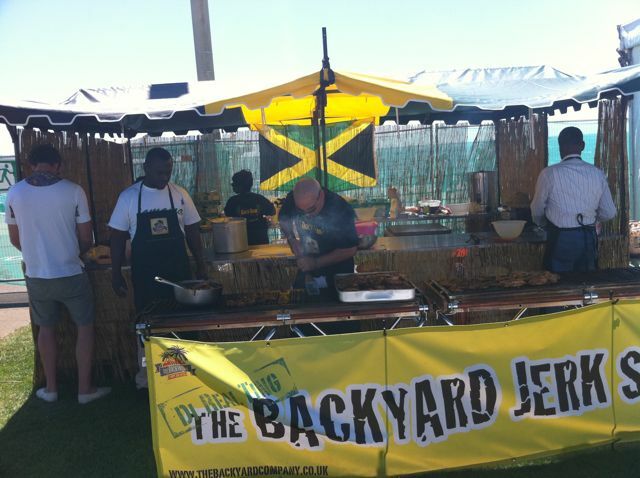 It was probably the loudest stall in the festival, with two Jamaican guys loudly singing and shouting about the product. 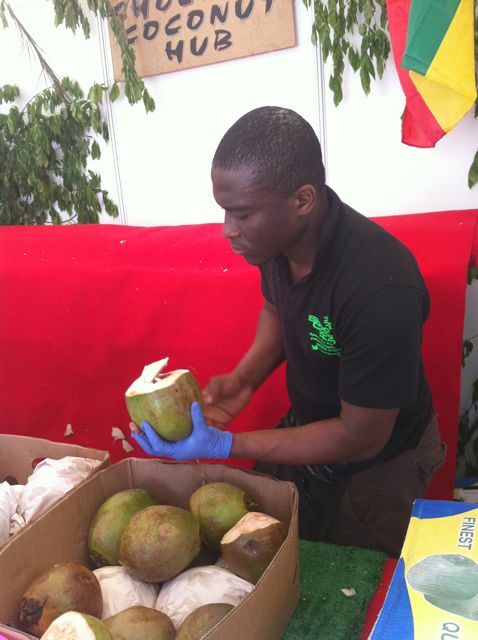 Which was…rum filled coconuts!! I’m not even joking. I love Ben’s hair in this photo. 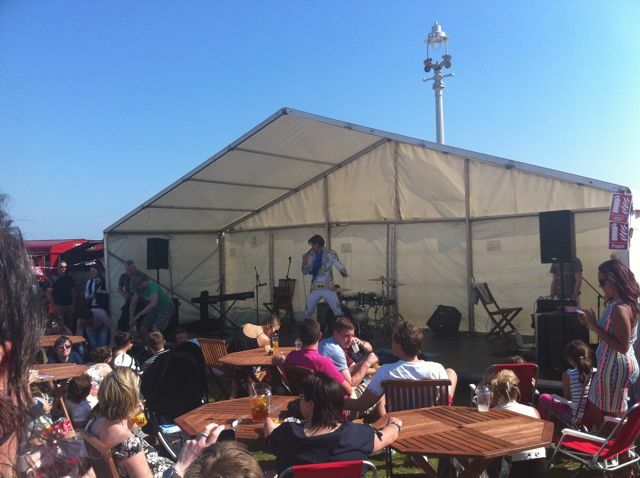 Unfortunately it’s not actually this Elvis-esque, it was just fairly windy down on the seafront. Each coconut cost an eye-wateringly 8 which I was finding quite difficult to come to terms with, until I saw the amount of rum we were given! The guy very cleverly sliced the top off the coconut and twisted the knife so it created a ‘lid.’ He then stuck two straws in it and handed it to us to ‘make room for the rum”! I love this guy! 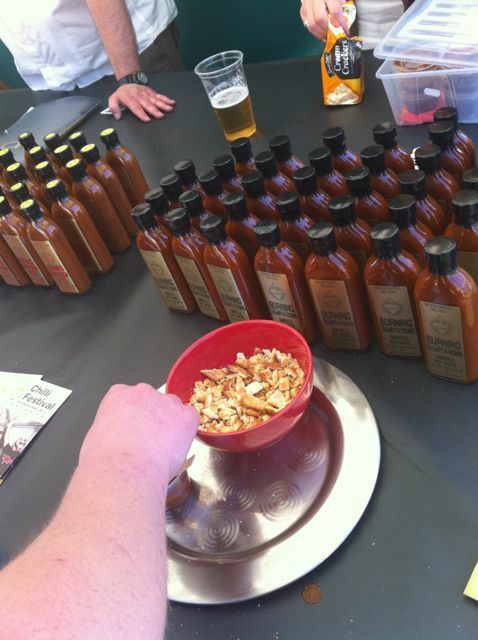 We sipped some of the liquid and it really was the most intense, fresh coconut taste. I wasn’t even sure I wanted to put rum in it because it tasted so amazing! 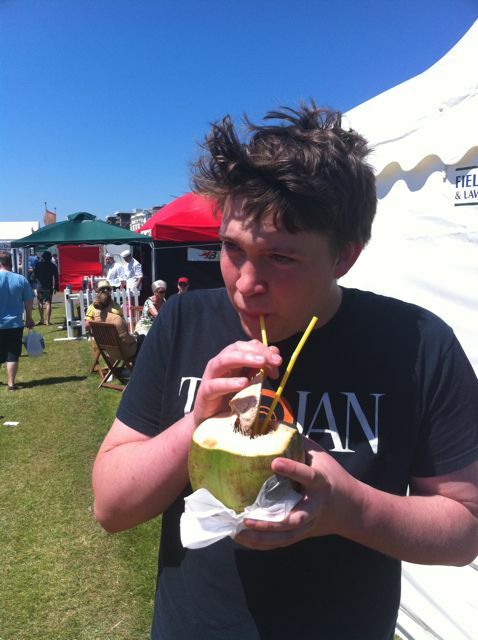 But Ben was having none of that and handed the coconut back to the man who poured a VERY generous slug of rum into it. He asked Ben if that was strong enough and handed it to him, who quick as lighteneing said ‘a bit more wouldn’t hurt!’ Oooh he’s a cheeky boy. So we then got another slug of rum. It was super strong but you could still taste the lovely coconut juice. Great way to kick-off our afternoon of eating and drinking! We finished our coconut in approximately 30 seconds and began our logical walk around the stalls, planning to see every single one and sample anything we could! 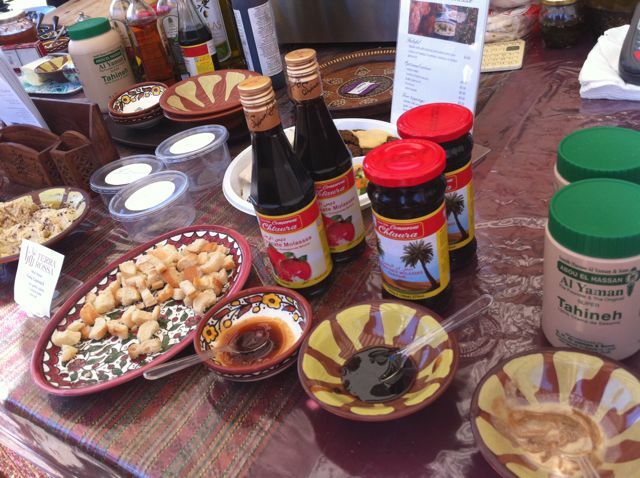 There were a tremendous amount of samples available which was fabulous and we were able to try lots of new and exciting food items we may not have bought or ordered in a restaurant. One stall we visited no less than 3 times was the lady selling freshly squeezed lemonade. Ben got one first and I scoffed at him because it was non-alcoholic and one of the reasons we went to the Brighton festival rather than the London one was because we could get the train so I could have a drink! However, the sun was beating down on us, it was absolutely boiling and my need for liquid refreshment was becoming a regular thing. So having tried Ben’s lemonade and experiencing the wonder for myself, I doubled back and bought one. And then another one an hour later. The lady had an old-fashioned lemonade press and I chatted to her for a while about where she got it from as I decided I needed one in my life! Unfortunately it seems she had it specially made and shipped over from America so I’m guessing it’s not in our price range. The lemonade was fantastic though, consisting of freshly squeezed lemons, sugar syrup and ice. Amazing! 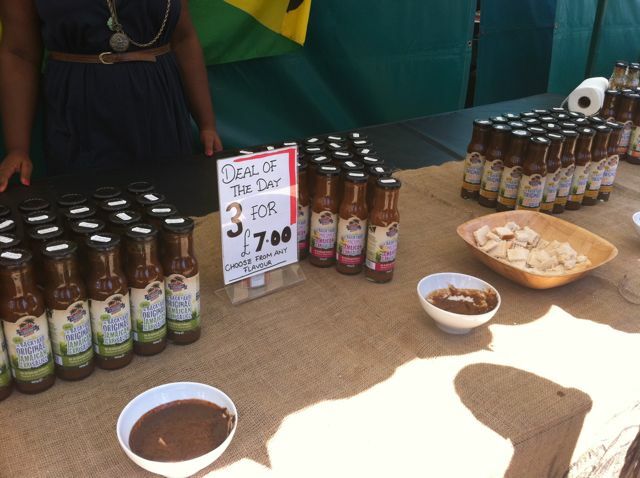 This stall was selling the most amazing combo salad dressing / marinade / dipping sauces! We dipped some french bread into a couple of the varieties and immediately placed an order for both bottles! I bought the lemon and black pepper and Ben got lime and ginger. I’ve used the lemon and black pepper one as a marinade on barbecued chicken and it was delicious. Good buy! Now, this next stall was one of the highlights of the day. 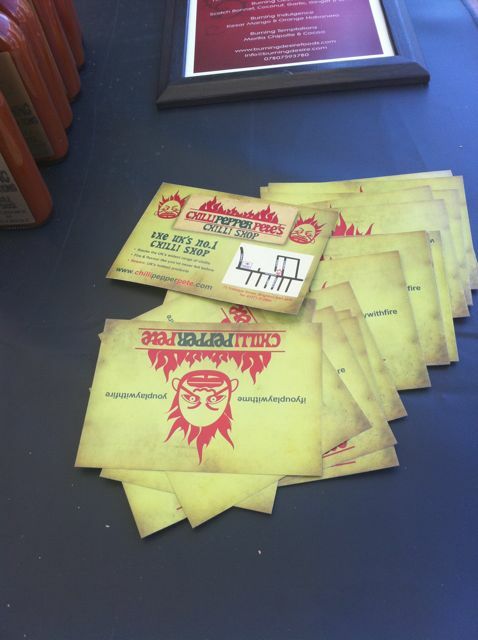 It was a guy called Pete who specialises in hot chilli sauces. Hence, Chill Pepper Pete. Genius! This was moments before it all kicked off. I’ve never seen him react so violently, or so quickly! His face immediately went a concerning shade of maroon and his eyes started watering profusely. I was quite alarmed and guided us away from the chilli sauce stall and over to a free spot of grass where he could regain his composure. Trouble was, the chilli sauce was clearly still reacting quite dramatically with his body and he didn’t fully recover until a good half hour later! He kept saying ‘my tongue is still on fire. still, on fire.’ Bless! He needed something to soothe his burning face and an ice cold sorbet seemed like it would do the trick. 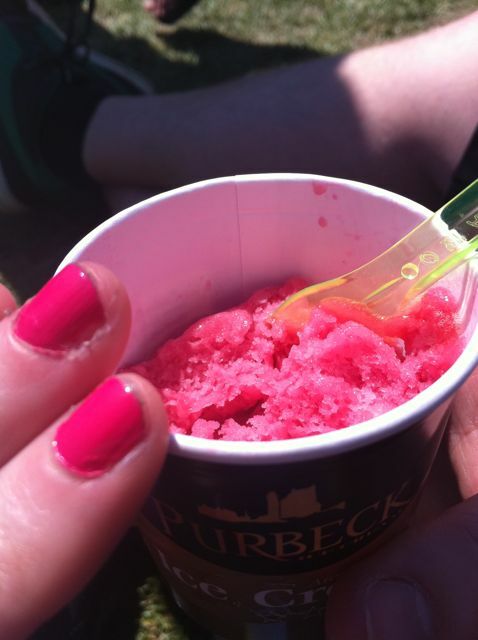 He got a scoop of raspberry and I was very impressed as it matched the shade of my nail varnish perfectly! Which warranted a photo, obviously. Girls, eh!? 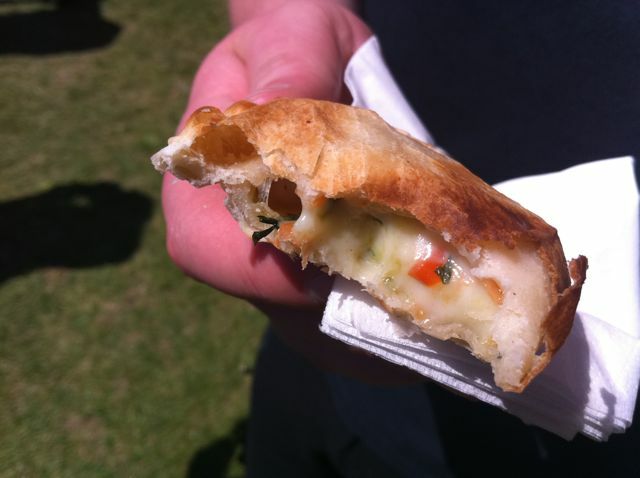 We finished up our stroll around the stalls, picking up samples here and there, notably this little lovely which was a cheese and spinach empanada! Delicious. We then decided to make the effort and check out the star of the day, Mr Lloyd Grossman himself, who was doing cooking demonstrations throughout the day in a marquee in the middle of the festival. We tried to book seats for the event when the booth opened at 1pm but the queue was snaking round back through the entrance so we left it. When we walked past just before the demonstration was due to start, there were free seats! Score! I was so excited to see the legend that is Lloyd Grossman that I took a ton of photos just of him, before the cooking had even started. I will share just one, for your viewing pleasure. He was wearing a stunning hat! The cooking was done by what seemed to be Lloyds right-hand man, a lovely guy who was genuinly passionate about Lloyd’s range of supermarket products. He cooked spinach and ricotto gnocci and mushroom risotto, both of which we got to taste at the end and were declared delicious! As the cooking demonstration came to an end we made our way out of the marquee and back to the stage to check out what was happening. As we got closer I nearly wet myself as I could see a figure on the stage who had the potential to make this Foodies Festival one of the best days of 2012! Or, a lady who looked a LOT like her and was an excellent all-round performer. She sang, she danced, she chatted with the crowd and got everyone singing along. She was brilliant! She was also joined on-stage by none other than ELVIS PRESLEY who performed some songs with her and also did his own set. The atmosphere was brilliant and I was absolutely loving life – if you haven’t guessed I absolutely love all things Elvis and Marilyn so it was such a treat to see these two tribute acts…especially when I wasn’t expecting to! We grabbed some snacks and drinks and settled down to watch the show. 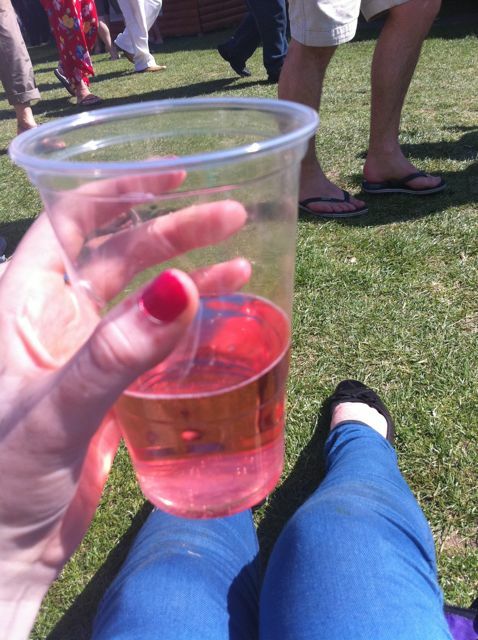 Strawberry and Lime cider! A must-have. This was Ben’s snack of choice! 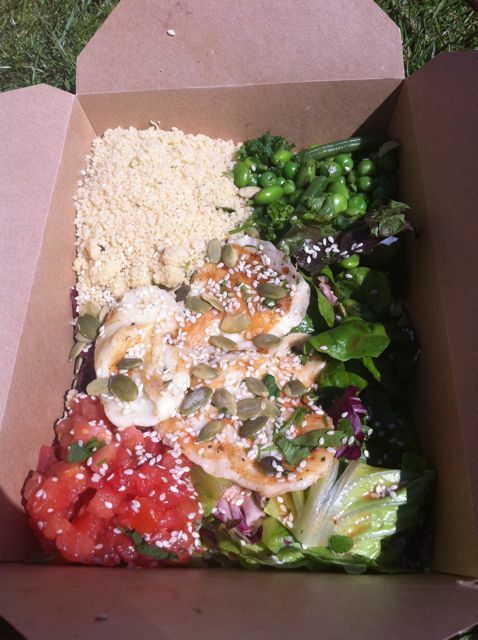 A delicious grilled halloumi salad from a stall specialising in exciting and unusual salad combos. The lovely recycled cardboard box was stuffed with a plethora of yummies including edamame, watermelon, cous cous and seeds. He really enjoyed this and it was the perfect antidote to his hot-sauce hangover. 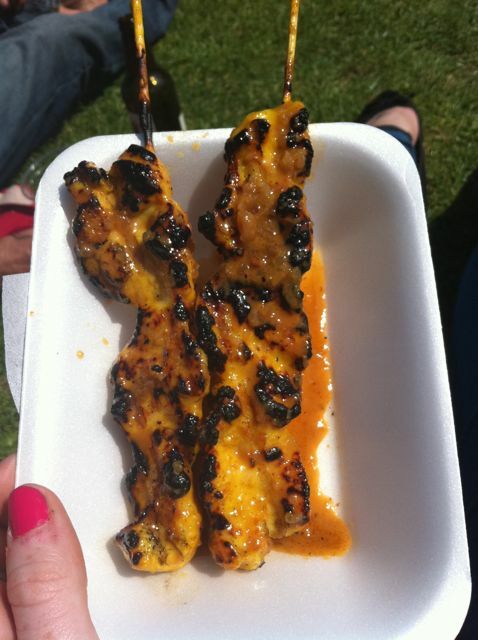 I was absolutely stuffed from all the nibbling and lemonade-downing I’d been doing so opted for a lighter choice – satay chicken skewers. Anything that is essentially marinated in peanut butter is a winner in my book so these went down a treat. This was our view! It was such a gorgeous day, we were very lucky. 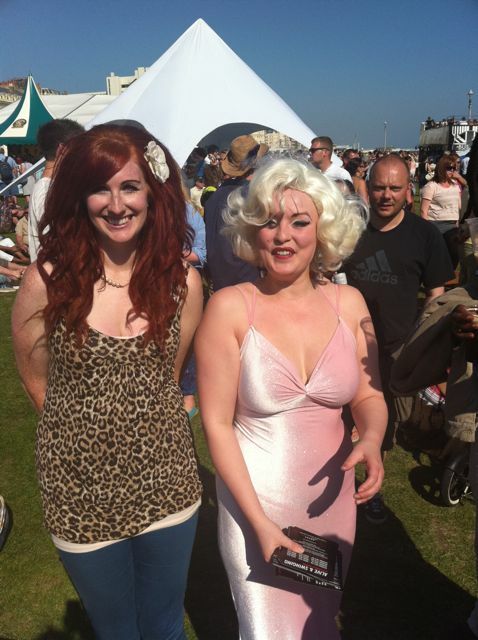 Finally, the cherry on the top of my day…I got to meet Marilyn!! 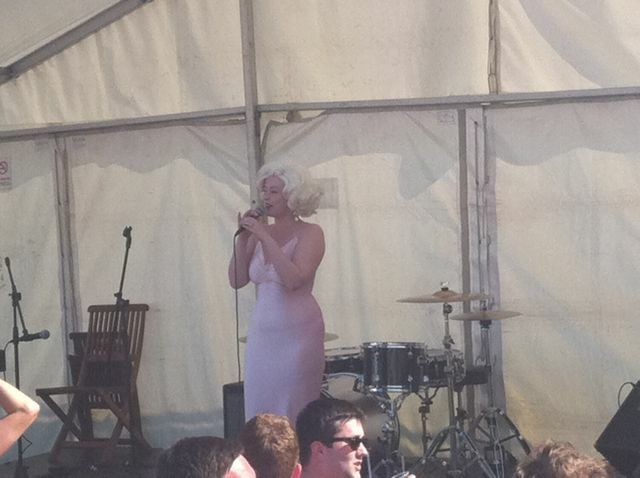 Perfect summers day – great food, great drink and fabulous entertainment. 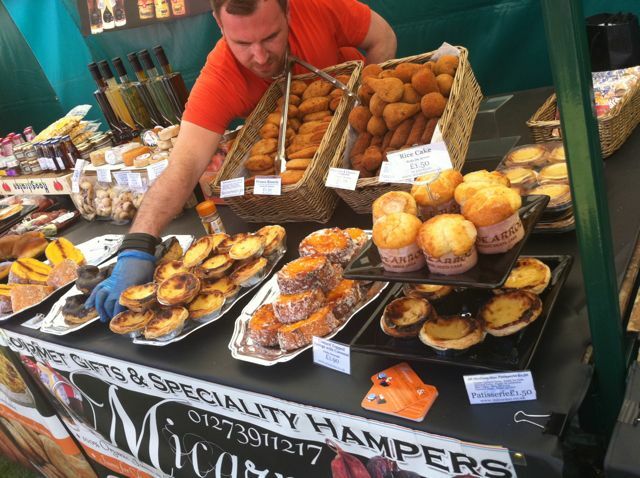 We will definitely be attending the Foodies Festival again next year!